These Avocado Deviled Eggs are made without mayo, but still have the classic flavor I grew up with. I love how easy they are to make, using creamy avocado in the filling! How Are Deviled Eggs Made? Traditional deviled eggs are made with the yolks from hard boiled eggs, mixed with mayo, mustard, and some sort of acid, like lemon juice or vinegar. The mixture then gets piped back into the hard boiled egg whites for a flavorful appetizer. Why use avocado instead of mayo in this recipe? Avocado is a healthy source of fat, without using any added oil. If you’re like me, and aren’t the biggest avocado fan, this recipe is a great way to make them a little more palatable. I can’t taste the avocado flavor at all! To get started with this deviled egg recipe, you’ll need to hard boil the eggs first. 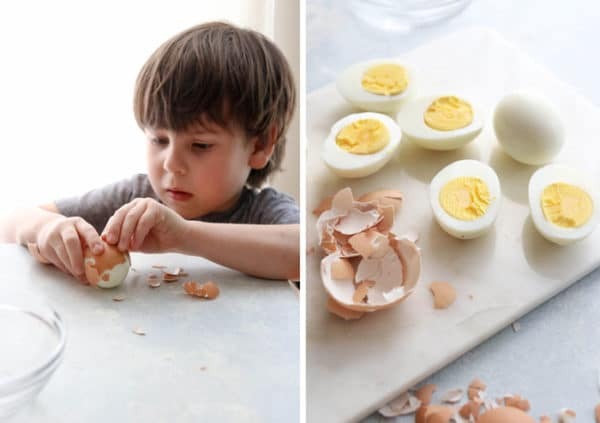 I make Instant Pot Hard Boiled Eggs to make the process fool-proof (and much easier to peel— even my kids can help without breaking the whites! ), but you can use the stove top method included in this recipe, if you prefer. Make sure you always place your cooked eggs in an ice bath immediately after cooking to avoid a green ring around the egg yolks. Cut the cooled eggs in half and remove the yolks. Combine them with avocado, mustard, lemon juice, and my favorite– pickle juice– for a bit of an umami flavor. 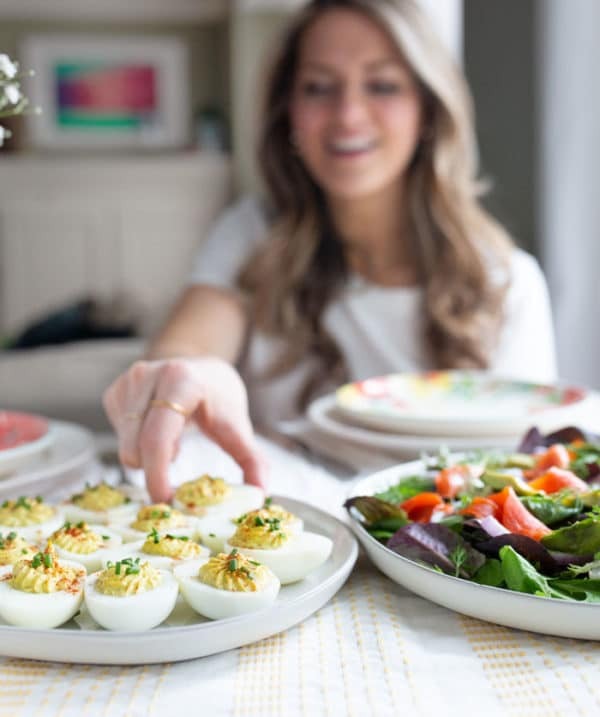 What’s great about making deviled eggs is you can taste the filling as you go, until the flavor is perfect to YOUR taste buds. Once the filling is seasoned to your liking, you just need to pipe it back into the hard boiled egg white halves. I use a plastic bag with corner snipped off, but if you have a piping bag that works even better. Garnish with a sprinkle of paprika and chopped chives, and you’ll have a pretty presentation for any gathering. Does the Avocado Filling Brown? I’ve made this filling the night before I want to serve the Avocado Deviled Eggs, and it kept it’s color well, without turning brown. (Probably due to the lemon juice & mustard!) As you know, avocados will turn brown when they are left out on the counter too long, but an acid like lemon juice can slow down that process. I recommend storing the filling in an airtight plastic bag (with all the air squeezed out of it) for the best shelf life. You can then use that same bag to pipe the filling into the egg halves the next day. 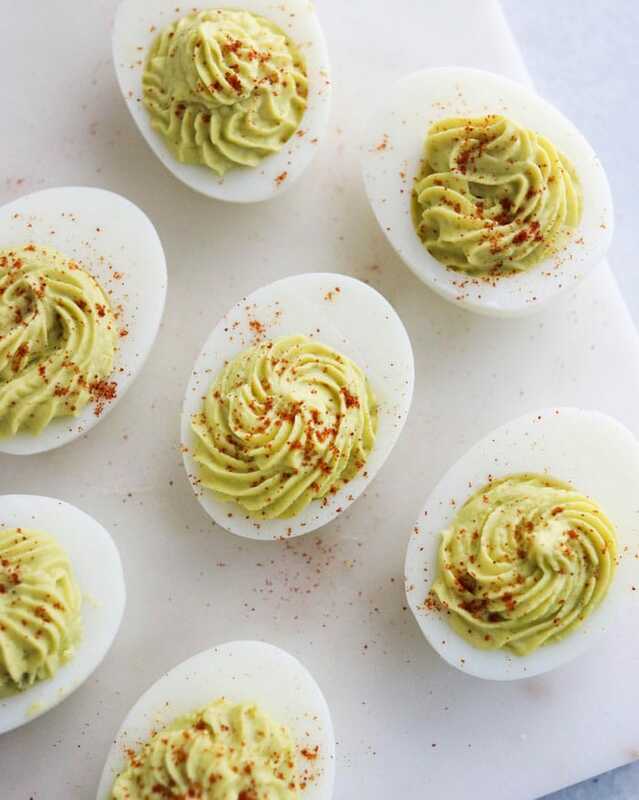 These Avocado Deviled Eggs are a quick & easy recipe without using mayo. I love that you can't taste the avocado at all! Hard Boil the Eggs: Place the eggs in a saucepan and cover them with an inch of water. Bring the water to a boil, then cover the pot with a lid and remove the pot from the heat. Let the eggs stand for 13 minutes, then immediately place them in an ice bath. Peel right away once they are cool, to make the shells come off easier. Prepare the Filling: Cut the hard boiled eggs in half, and place the yolks in a small food processor or blender. Add in the avocado, mustard, lemon juice, 1 teaspoon of pickle juice, salt, and 2 tablespoons of water. Process until smooth, stopping to scrape down the sides if needed. Taste the mixture and add one more teaspoon of pickle juice or water, if needed. If you want more of a tangy flavor, you can also add more lemon juice to taste. I like the subtle sweetness that using bread & butter pickle juice adds, but feel free to use any other type of pickle that you like. For texture, you can even add finely diced pickles instead of just the juice. Once the filling flavor is to your liking, transfer it to a plastic bag. You can use a pastry tip if you have one, but cutting the corner of the bag will create a nice piping effect, too. Arrange the egg white halves on a large plate and pipe the filling into each half. 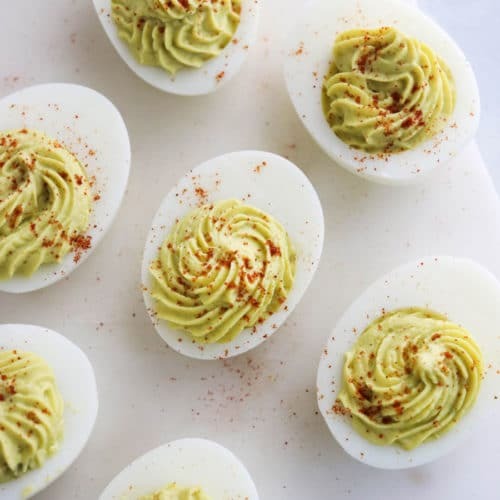 Garnish the avocado deviled eggs with paprika and chopped chives, if desired, then serve right away or keep them chilled in the fridge until ready to serve. 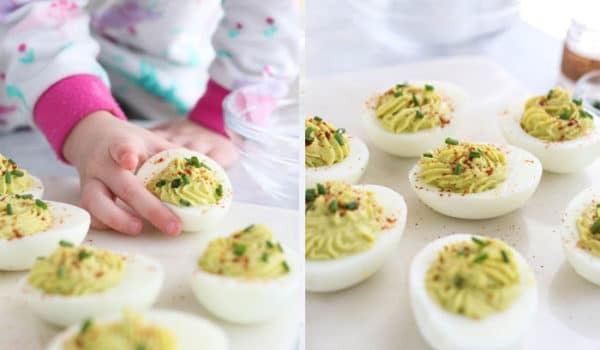 The prepared deviled eggs should keep well for up to 3 days, but the filling may start to brown if you don't keep them tightly covered after the first 24 hours. See my notes in the post for make-ahead tips. What other recipes require avocados? If you need some ideas to use up the rest of your avocado, try one of the following recipes. As you know, I’m not the biggest avocado fan, but these recipes make me love them! Tell me, how do YOU use up half of an avocado when you have it around? You could also use it to make guacamole or slice it up for a topping for sweet potato toast! Reader Feedback: Do you like deviled eggs? Have you ever tried adding avocado to them before? Wow, I wasn’t sure about the avocado addition but it’s really good! Couldn’t even taste it. These are so good! I made half the batch to have on hand as a snack in my fridge this week, and you’re right, you can’t taste the avocado at all! The pickle juice makes this extra delicious. I used 2 teaspoons. 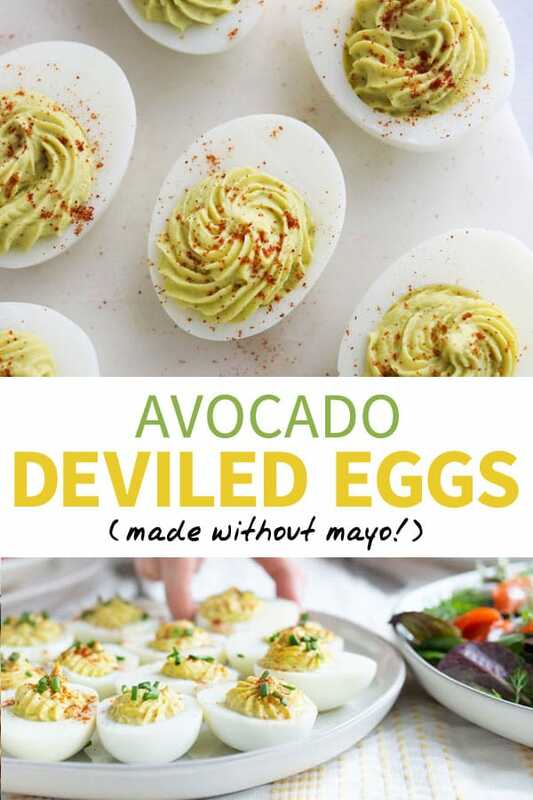 I’m not an avocado fan but I love deviled eggs. 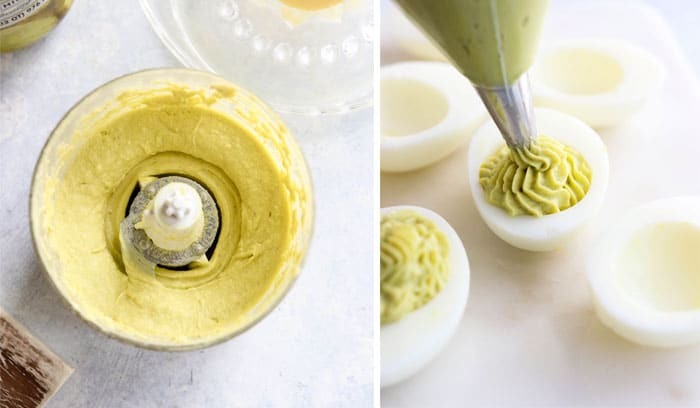 Your Avocado Deviled Eggs look absolutely delicious! I’m definitely going to try them. I plan on incorporating the healthy avocado into my diet: Guacamole, Avocado Cilantro Dressing. I’m inspired. Thanks!